Jer 14:17-22 Let my eyes stream with tears over my people's destruction. We wait for peace and healing to no avail. We recognize our wickedness. Remember your covenant with us. We look to you alone, O Lord. Ps 79:8-9, 11, 13 "For the glory of your name, O Lord, deliver us." We're brought low. Deliver us and pardon our sins. Then we'll give thanks to you forever. Back to Sunday! Thanks to ACC colleague Eileen O'Brien for telling me about a homily of Fr. Curtis Bryant, S.J. on Sunday's gospel: We are the 'buried treasure' and 'pearl of great price' that God bought with his Son! Stedman echoes this, controversially at the expense of more traditional interpretations. Creighton: The encounter with Jesus is a real one with a loving God who calls us to new life. Jesus calls Martha to be present. Jesus invites us to true presence and real life. Resurrection is both now and later. Don't let daily burdens steal the present moment. Jesus invites Martha, and us, to not let good things stand between her and something better. One Bread One Body: Many Christians feel alone in their service like Martha did. 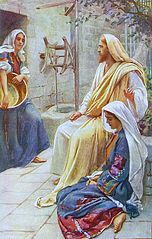 Martha complained to Jesus that he should get her help. When we ask him for a helper, he may not send anyone; maybe we should "not do something but sit there." After being alone with Jesus, we may have the strength to serve alone, or see God raise up helpers. DailyScripture.net: Martha believed in the resurrection. Jesus offers God's abundant life. Universalis: Martha was the sister of Mary of Bethany and Lazarus. In the West, her feast is a week after Mary Magdalene's because of the old and likely incorrect tradition that the Marys were the same. But we forget Lazarus who died, was raised, and had to die again... See Catholic Encyclopedia.